The Make Believe Company first impressed us with their sustainable Station One Chair and we’re equally enamored with their chunky Bruddy Blocks. Bruddy Blocks are an imaginative twist on two classic children’s toys: blocks and puzzles. Each Bruddy Block is made up of two pieces that connect together to create a simple puzzle. Bruddy Blocks may also be stacked, balanced, and used for building chunky towers. Each block piece is handcrafted with sustainably farmed New Zealand Radiata Pine and finished with a non-toxic walnut oil. An eye catching diagonal stripe pattern is printed on each block with water-based inks. This is the perfect starter puzzle/block set for wee ones that will stimulate both your tot’s hand-eye coordination and their imagination. The set of 6 blocks comes in a travel-friendly reusable muslin drawstring bag. The Make Believe Company first impressed us with their sustainable Station One Chair and we're equally enamored with their chunky Bruddy Blocks. 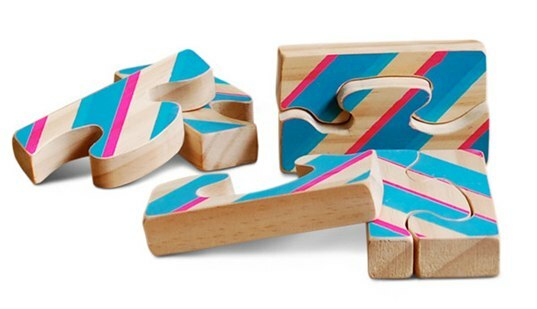 Bruddy Blocks are an imaginative twist on two classic children's toys: blocks and puzzles. Each Bruddy Block is made up of two pieces that connect together to create a simple puzzle. Bruddy Blocks may also be stacked, balanced, and used for building chunky towers. Each block piece is handcrafted with sustainably farmed New Zealand Radiata Pine and finished with a non-toxic walnut oil. An eye catching diagonal stripe pattern is printed on each block with water-based inks. This is the perfect starter puzzle/block set for wee ones that will stimulate both your tot's hand-eye coordination and their imagination. The set of 6 blocks comes in a travel-friendly reusable muslin drawstring bag.